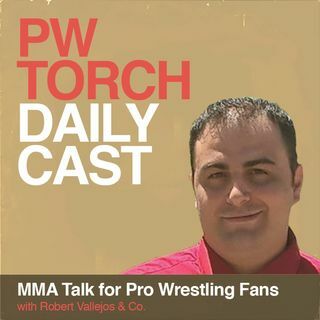 PWTorch Dailycast - MMA Talk for Pro Wrestling Fans w/Vallejos & Co.
On this week’s edition of MMA Talk for Pro Wrestling Fans, MMATorch.com’s Robert Vallejos and Rick Monsey discuss the UFC’s partnership with ESPN. They preview UFC on ESPN+ 1. The guys break down the Colby Covington situation, react to Jon Jones gloating about his negative drug tests, and give their take on the possibility of another Chael Sonnen vs. Tito Ortiz fight. Email topics include the possible negative implications of a Bellator champion losing to a RIZIN fighter. Rick and Robert ... See More project the pro wrestling potential of Frank Mir and Cain Velasquez, and close the show with an examination of the impending feud between Ronda Rousey and Sasha Banks.